Arriving back from Portland the night before near midnight, we had planned a day at the PNE. Poor planning on our part. Barely waking up in time to make it for the 11:00am opening time, we ended up parking quite far away. Not a really big deal unless you consider the fact I had forgotten my camera in the car. I had to run back to get it and catch up with Viv and the kids. I did so with considerable amount of effort. Sweating and hungry, I had to take my son on enough rides to make up for the all-day ride pass we had purchased. By then, it was well past lunch and considering the fact I hadn't eaten breakfast, I was on the verge of eating the first thing I saw. I resisted the urge and decided to try something different - The Roaming Dragon. Once again, the dirty "F" word rears its ugly head again. No, no, not that F word. Rather, what we are talking about is Fusion. You know, take one cuisine and do an interpretation of it. Or in really bad cases, merely an excuse for bad food. So we ended up going for all 3 offerings starting with the Pork Belly Sliders. 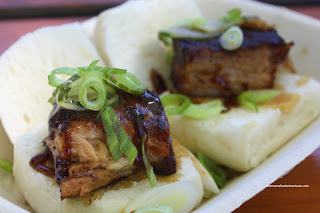 With a fatty and tender piece of pork belly, hoisin sauce, pickled cucumber a nd scallions served in a steamed mantou (seems like the new trendy bread), the slider looked promising. In actuality, it was good with one slight problem. I liked the soft sweet mantou contrasting the savouriness of the pork belly. However, the liberal use hoisin sauce overwhelmed everything else including the cucumber. Personally, I find far too many places using hoisin sauce as an "Asian" flavouring agent (like Terracotta). 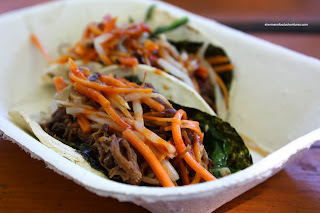 As for the Korean Tacos with shortrib, sprouts, shiitake mushrooms, spinach and carrots encased in a nori/tortilla combo with kimchi dressing, I found them to be only okay. They weren't terrible, but the flavours were muddled. I couldn't get any kimchi flavour or much of anything else really. And for me, the thing was too wet. 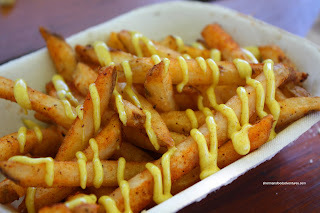 Finally, the Asian-Spiced Fries with curry mayo was decent from a taste perspective. Lots of flavour with a hint of curry. I wasn't a huge fan of the fries themselves. Yes they were crispy; but they were generic-like. Would've liked to see some creativity like thick-cut potato chips or Belgian-style fries. There is certainly potential here. Good ideas that need some tweaking. In terms of pricing, the regular prices are $6.00 for 2 sliders or 2 tacos and $10.00 for both. 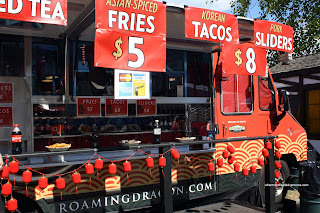 Not exactly cheap; but completely in line with other street food offerings in Vancouver. I think you are being too kind with your opinion, as I encountered a lot of issues with their food, like the sliders being too sweet (in the same lines of your issue with the hoisin sauce), et al. As for "cheap", the Chinese skewere stand ofers 3 skewers + bun + pop for $6.50 or 6 skewers + pop for $10... to me it is sort of a good deal (Vancouver standards, that is). You know me Kim... But then again, we do agree in theory. I didn't dislike the food, but as Constanza said to me, it was not bad; but nothing amazing as some other people have remarked. I don't understand why they just don't simply replace the hoisin sauce witn another sauce? I find almost everywhere in 604, "hoisin" sauce is everywhere...even with dishes that are not normally served with hoisin sauce...I guess it's because 604 is more Cantonese-dominated and hoisin is one of their main sauces...personally I prefer sweet flour paste.